I have posted about this before, but since our theater continues to grow and bring in new participants, patrons, and actors, I think it's time to revisit the idea of theater etiquette. What is acceptable for a move theater is very different (although, truth be told, it shouldn't be!) that what is acceptable for live theater...but unless you have really stopped to think about it, you may not realize it. The main difference is due to the fact that in live theater there are real people in real time performing for you, whereas in a movie it is pre-recorded. What this means is that the performers in a movie will not be distracted or interrupted by the reaction or action of the audience and their performance is the result of multiple takes, editing, and camera angles to bring you the best possible performance. In live theater, the real actors are right there in front of you, in real time and not only can they be distracted or interrupted, but they have only one chance at each show to bring you the best performance they possibly can. They don't get another "take" to get it right. So let's look another look at the etiquette expected from a live theater audience. First and foremost: BE ON TIME. In most professional theaters, if you arrive after curtain (start) time, you will have to wait until intermission to be seated. Many community theaters will still try to seat you, but you may have to wait until a scene change/break in the action. However, even in a community theater you may not get to take your seat late if the house if full and your seats are located where it will create a great distraction to get to. We know you paid for a ticket, but so did everybody else and it is not fair to the other patrons or the actors to interrupt the whole show to help you find your assigned seat in the darkened theater. Most theaters cannot compete with the special effects and point of view created by movie magic, so it relies on the willing suspension of disbelief from its audience. Interrupting the flow of the show once it has started takes the audience out of the fantasy and makes it difficult to recapture the magic. Many theater also have a 10 minute policy for will-call tickets: if you haven't picked up your ticket by the 10 minutes to curtain mark, you ticket may be released and resold. The best solution is to simply plan ahead and make sure you arrive in plenty of time to find parking, use the restroom, hit concessions, and pick up your ticket. Second, and another important point: TURN OFF YOUR CELL PHONE! Taking a call during a show is one of the rudest and most disrespectful things you can do in live theater. Not only does it show a total lack of respect for the patrons around you, but it also shows a disdain and disrespect for the actors on stage. Texts are no less rude. The noise and light of a cell phone is distracting to the show for both the audience and performers. And filming or photographing is also right out. Theaters and production companies sign contracts when the license show rights and these usually include a stipulation to not record the show. Even for marketing purposes, the rights to record even small sections are severely restricted. So not only is it distracting to other audience members and the cast of the show, it is also very likely illegal. Not to mention that it could be considered intellectual theft. (http://www.playbill.com/article/ask-playbillcom-why-cant-i-take-photos-in-a-broadway-theatre-com-180456 ) Some theaters are relaxing their pre-and post-show photography rules, but even then it is not okay to take pictures during the show. There have been instances in live theater where an actor has stopped the show to call-out a cell phone user. (http://people.com/celebrity/kevin-spacey-in-character-stops-show-to-scold-audience-member-for-ringing-cell-phone/ http://people.com/theater/glenn-close-stops-sunset-boulevard-photo/ ) I would say that is an inappropriate response, but day after day of audience disrespect can wear on an actor and sometimes enough is enough.) Suffice it to say: Don't be that person. Turn off your cell phone. UNWRAP YOUR COUGH DROPS BEFORE THE SHOW. Unwrapping cough drops or candy is surprising loud when everyone around you is being quiet. Paper crinkling is an unwelcome distraction. Along the same lines is: DON'T TALK ONCE THE PERFORMANCE HAS STARTED. The only noise in the theater should be coming from the stage (or speakers) as part of the show. Talking, unwrapping candy, squeezing your plastic water bottle...all of these things are distracting to the patrons around you and to the actors on stage. And along with don't talk; DON'T HUM OR SING ALONG WITH THE ACTORS unless they have asked you to. People around you paid good money to hear the actors perform. Buy the soundtrack and sing along in the car. In the theater it is just rude. REMEMBER THAT THERE ARE PEOPLE BEHIND YOU. Leaning together and cuddling or wearing a large hat, or not sitting correctly in your seat blocks the view of the stage for the people behind you. Please remember to be courteous to other patrons; they want to see the show too. I can't say I thought I would ever have to actually say this one, but based on actual experience, I must. DO NOT TAKE YOUR SHOES OFF IN THE THEATER. This is not your living room and removing your shoes is inappropriate and potentially offensive. Theater etiquette basically comes down to common courtesy and common sense. If you take a moment to think about it, you won't have any trouble. Theater is a shared experience and a good audience member will do what they can to be a positive part of theater experience for themselves and everyone else. Theater Etiquette Part 2: Children and live theater? YES! Live theater can be a magical and memorable experience for children of all ages. It truly is one of life's greatest cultural treasures. When the experience is done well, it can create a lasting joy and appreciation for theater for the rest of their lives. Done poorly, it can be a disaster for everyone: the child, the rest of the party, and the other patrons. What makes the difference? Preparation and education. Below are some guidelines for bringing children to the theater. 1. Show selection is the foundation on which everything else is built. If you bring a child to a show that they won't enjoy or understand then it will be impossible to keep them engaged in the production. Not all shows are a good fit for children; including musicals. Make sure you have selected a show that will be of interest. Shows designed for children (like Broadway Jr. shows or ones based on children's books like Charlotte's Web) are a good starting spot. And remember, just because a musical is a classic, doesn't mean it doesn't have adult content. Even The Sound of Music has Nazis! Everyone is different, but typically: Toddlers through the age of 4 do well with short productions (>40 minutes) with a lot of audience participation. Pre-schoolers, ages 4-5 can handle longer shows (50-75 minutes) as long as the material is interesting to them. Another plus to choosing a show designed for children is that the actors expect a certain amount of fidgeting, as that's part and parcel of childhood! 2. Get your tickets for seats near the aisle, if possible. That way if it turns out that it just isn't a sit quietly kind of day (and don't we all have those? ), you'll be able to take your child out to the lobby for a break. The House Manager will be probably be able to help you rejoin the show later. 4. Make sure children use the restroom before the show. Remember: their bladders are smaller than yours! 5. Go over general theater etiquette with your kiddoes before they arrive at the theater. Everyone can join in to clap and show appreciation for the actors at the end of the show! 7. And tell them a bit about the plot of the show so they know in advance who the characters are and the generalities of what will happen in the show. 8. Remind them that the actors are real people just like them. They may be wearing a mask or makeup, but underneath they are a real person! With a little bit of preparation, live theater can be an exciting part of any child's life! 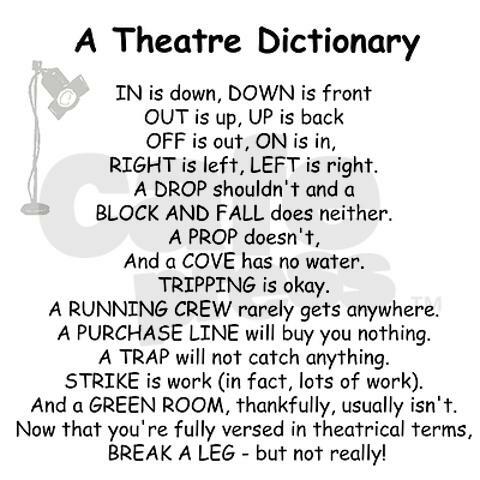 Not sure who came up with it, but it's pretty darn funny, as theater jargon goes. Not all community theaters have the facilities to require the use of all these phrases, but let's take a look at a few that are specifically used at the Hamilton Playhouse. PROSCENIUM: The opening of the wall between the audience and the stage or, more poetically, the picture frame through which the audience watches the performance. CALL TIMES: (verb) To verbally note the countdown to the start of the show. FLAT: A wood frame covered in muslin or wood (plywood, Masonite) that is used as backdrops, walls, and masking on a set. GREEN ROOM: The backstage area where actors relax. It is not usually green. At Hamilton Players it doubles as the dressing room. CHEAT OUT: Angling your body (as an actor) to face the audience. STAGE DIRECTIONS: 1.) The directions in the script telling actors how and where to go. 2.) How an actor orients himself on stage: Stage Right - the actors right, facing the audience; Stage Left - the actor's left, facing the audience; Up Stage - the stage area away from the audience, towards the back wall; Down Stage - the stage area nearest the audience, towards the apron of the stage: Center Stage - the area in the middle of the stage. THE SCOTTISH PLAY: This is what superstitious actors call Shakespeare's Macbeth. It is considered extremely bad luck to say the word "Macbeth" inside a theater at any time. Lore says that if you say it, to remove the curse you must leave the theater, spin around 3 times to your left, spit, curse, and then knock to be readmitted. GHOST LIGHT: A single, uncovered light left on onstage when the theater is dark (closed). In terms of safety it helps the first person in find the light switches, but superstition says it gives the theater ghosts a light to perform by. In 2012 the British Museum had a book on display that rivaled the Gutenberg Bible for media attention. The book was not particularly old, it wasn’t a rare text, it wasn’t a clean text; it had scribbles in the margins and was obviously well used. It had been owned by Nelson Mandela. but more than that, it had been owned by Nelson Mandela in prison and for years this so-called "Robben Island Bible" sustained and inspired him.. He often read aloud from it to his cellmates and it inspired and sustained them all. The book? Not scripture, but sacred nonetheless. It was the Collected Works of William Shakespeare. Those characters, those stories…they sustained him and others through those dark years in prison. That, my friends, is the power and magic of theater. Hamilton Players’ mission is to put the spotlight on education, inspiration, and community through the performing arts. But even more important than our mission, is “why” behind it. What drives us, as an organization, is a belief that live theater has the power to change individuals, both those who participate in it, and those who view it. Performing on stage is a life-changing event–you can never be the same, afterward, when you’ve worn another person’s life in front of an audience. Each time, you become a little more open-minded, a little more understanding, a little better parent, a little better neighbor. Just a little better. Over the years Hamilton Players has staged more than 100 major productions, everything from classic Shakespeare to a drama about the effects of 9/11; from big musicals with upwards of 50 performers, to intimate 1- and 2-person shows. In the course of a typical year, easily 5,000 people--and sometimes as many as 7,000--will attend or participate in our productions and events. Imagine that: 7,000 opportunities for our community to become just a little better. That’s the power and magic of theater. Hamilton Players has a large and growing number of all-purpose volunteers of all ages; an extraordinary corps of performers, directors, musicians, dancers, costume builders, designers, helpers, advisers, and artists. All of them participating because they have each, on their own, decided that this is the most valuable thing they can do with their time, the most important thing they can do for their community. Not everybody enjoys being out in front of an audience, but nearly everyone enjoys the feeling of having contributed to something larger than themselves, and a Hamilton Players production offers just that. Beginning with nothing more than words on a page, everyone - from the director right on down to the person who checks to make sure there’s toilet paper in the bathrooms - begins working together to create the transforming experience that the audience has. Inspiration. Teamwork. Community. That’s the power and magic of theater. I don't know how it works at other nonprofit community theaters, but here at Hamilton Players we have only a tiny paid staff: Executive Director (FTE), 2 box office interns (>.5 FTE), a house keeper (.25 FTE) and a handful of transient or "seasonal" artistic staff that come and go; tied to a specific show. Everything else is staffed by volunteers...which is amazing...and also difficult. For years our organization has had a paradigm of very loose leadership for volunteers; if you want to volunteer, great! Have at it! That worked well when Hamilton Players was a loose collective that came together to put on a show and then disperse. But once the Players had a formal venue that required constant attention and upkeep, and expanded the programming to more than two isolated shows per year, AND became a corporation and nonprofit; the volunteer needs increased substantially and more often than not, the old-school "Have at it!" concept led to dissatisfaction for both Hamilton Players and the volunteer. Projects would get started by one and then finished by another; leaving both frustrated and dissatisfied. Information, or rather; misinformation, was passed along according to each individual's varying understanding of the situation. The administrative learning curve for nonprofit and corporate legal requirements was steep and suddenly there were a lot more volunteers to keep informed and many of them were disgruntled to find that the way they had been doing things was no longer acceptable to the organization. Plus there was the added pressure of satisfying insurance requirements or face constantly increasing premiums. This led to a huge turnover in volunteers, a variety of unsafe practices, and a widely varying quality of experience for volunteers, patrons, and donors. Dissatisfaction led to reduced volunteerism which in turn led to more work and responsibility being heaped upon volunteers, which led to more dissatisfaction and reduced volunteerism. It was a slow, deepening spiral of negativity that was impacting the organization on all levels. Fast forward to today. 2016 marked the 20th anniversary of the Hamilton Playhouse, Hamilton Players home venue. It also marked the start of a newly reorganized volunteer committee with a commitment to growth and excellence. By "growth" I refer to volunteer recruitment and by "excellence" I refer to both the experience to and from the volunteer. Hamilton Players has made some mistakes in the past, but we are working hard to create an environment where volunteers are integrated into the day to day culture of the organization, given responsibility and autonomy, and are appreciated and rewarded. We want volunteers to become a part of the fundamental structure of the Playhouse day-to-day activities. In the name of transparency, volunteers need to know that there will be some training up-front. Policies and expectations will be clearly outlined as will the structure and processes of the organization. Depending upon the position, there will also be periodic evaluations to help keep expectations - on both sides - in alignment. Sure, there are rules, but within that framework real magic can happen. Change cannot happen overnight, but Hamilton Players is making a dedicated commitment to develop an organizational culture that is open and appreciative and values dedication, creativity, collaboration, and accountability - both from employees and volunteers. Hamilton Players invites you to become a part of the theater family. See what's new and bring your own special talents and strengths to work with us at the Playhouse! We look forward to seeing you soon!